You’re rewarded with money in your piggy bank for every line of blank spaces. Click here to play! And when you’re bank it too full to hold anymore, the piggy is broken open and the money goes straight to your pocket! There aren’t many banks out there with that kind of service. Of course, you’ll roll for regular line wins as well. In fact, Bank On It pays out pretty well whether your get a winning combination or not. Spin triple red lucky sevens and you’ll see up to 1400 coins deposited into your balance. Three blue lucky sevens will get you 600 coins. Single, double and triple bars are there too, waiting to fill your account with plenty of golden coins. What’s most exciting about this bank account is that it offers Wild symbols that will match any other symbol on the pay line. This helps you create more winning combinations, which means money, money, money! So get into Bank On It and start saving up for your rainy day. The Wild symbol will substitute for all other symbols. 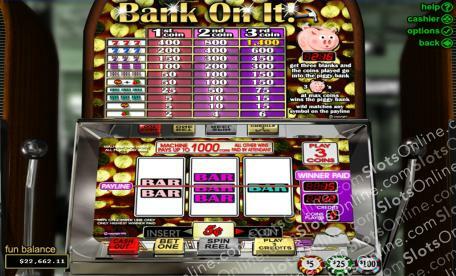 If you spin three blanks across the payline, three coins will be put into the Piggy Bank at the top of the screen. Once the Piggy is full and you spin three pigs across the pay line, the bank is broken and all the money inside goes into your account.